Ending today (5/15), Macy's Home Sale with an Extra 30-50% off with code SUMMER at checkout. I'm seriously thinking about grabbing a GREAT set of sheets for once. 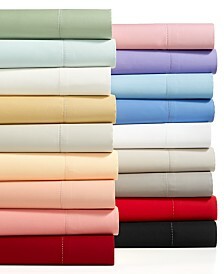 I came across these King 4-Pc Sheet Set, 550 Thread Count 100% Supima Cotton, Created For Macy's $120 (Retail $200). Shipping is FREE when you purchase a beauty item or purchase of $99.